Star Wars: The Old Republic (known as SWTOR) is a free to play MMORPG set in the Star Wars galaxy far, far away. In the game players get to play as iconic roles from the movies, games and expanded universe novels such as a bounty hunter, Sith, Jedi and more and then head off to familiar and foreign planets; from the infamous Tatooine and the less travelled Nal Hutta visualised for the first time in the game. 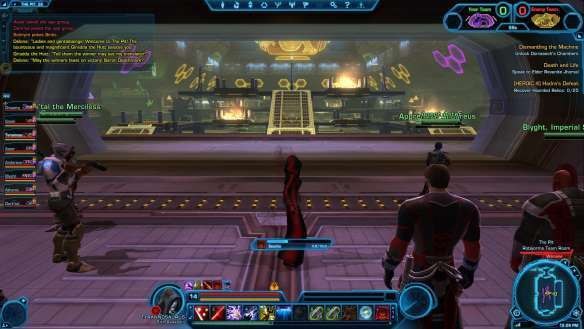 The game offers full MMORPG functionality with various gameplay and social systems to make a well-balanced MMO wrapped up in a Star Wars title. Character creation begins with players choosing their faction as either a member of the Sith Empire or as the Galactic Republic, home of the Jedi. Depending on your choice of faction players will have access to different classes and species allowing for various combinations. Play as a Sith Pureblood under the Empire and unleash the powers of the dark side as a Sith Warrior or Sith Inquisitor, or join them as a Chiss Imperial Agent; deadly assassins and operatives that have aligned themselves with the Sith Emperor. Alternatively join the forces of good, the Galactic Republic and their thousands of brave Republic Troopers, aligned Smugglers who have chosen to aid the Republic in the war effort or even the light side force users, the Jedi Order. Pledge allegiance to one of these factions and ready yourself for the war that slowly unfurls as skirmishes upon various planets are bringing an end to the tentative peace that has lasted these last few years since the Sith returned to the Galaxy. The game offers an in-depth story driven quest arc including individual personalised class quests where your actions will determine the outcome of the story. Players can quest on the various planets in challenging PVE, head into treacherous dungeons with groups or their AI companions and even fight among the stars in their own personal starship offering exciting PVE combat. For those who prefer PVP there are numerous “Warzones” to take part in on various planets with objective team based combat from the battle on Alderaan where opposing teams fight for control of neutral turrets to try and shoot down the enemy starship or the more fast-paced casual “Huttball”, a futuristic football game where players must get the ball into the opposition goal whilst dodging a variety of acid pits and flamethrower projectiles! The game is free to play with a subscription-based option, in the free to play game players have access to the majority of the game features and can quest to Max level, however access to war zones, multiple characters and other features are restricted to subscription models. Players can either pay a monthly subscription for all content or tailor their subscription to specific features that they wish to unlock such as extra character slots, unlocking war zones as well as having to purchase the Digital expansions that come free with a full subscription.